Your first razor was probably a cartridge razor. There’s a reason your parents purchased it for you when it was time for your very first shave. 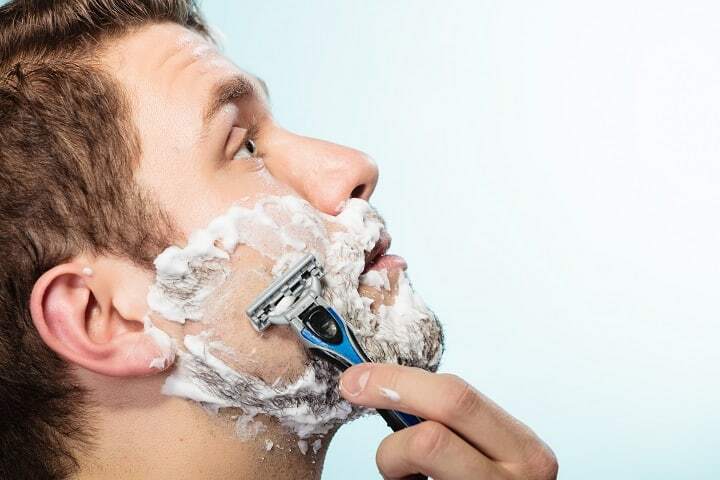 The alternatives to cartridge razors (such as straight razors or safety razors) are a great way to end up with a nicked-up face if it’s your first time shaving. Shaving purists and beard gurus will argue in favor of fancier, more difficult shaving accessories, but there’s something to be said for the cartridge razor. It may not be the classiest, most luxurious way to shave, but it’s straightforward and simple. No razor is quite as foolproof as the cartridge razor. It might not deliver the baby-soft shave of more difficult razors, but it’s hard to muck up and can be used pretty much anywhere on your body. It’s no shock then that you can find cartridge razors just about everywhere. They’re pushed in supermarkets, endorsed by your favorite athletes and plastered all over billboards and television. In fact, there’s a pretty good chance you’ve already used a cartridge razor. Along with hair clippers for home use and the finest beard scissors, they’re some of the most popular shaving tools on the market today. When asked to picture a razor, it’s probably a cartridge razor that comes to mind. This is since cartridge razors are so widely used and marketed. In case you’ve never heard of a cartridge razor (or you’re not sure if what you’re picturing is indeed a cartridge razor), we’ll do a bit of explaining. The cartridge razor was first developed in the early 20th century by King C. Gillette. If that name rings a bell, you’re on the right track. Today, cartridge razors are mostly produced by shaving giants like Gillette, Schick and Dorco. They consist of a body and a cartridge-like head that normally has between two and five blades. Usually made of plastic, they have a joint attaching the cartridge and handle allowing the razor to swivel slightly. They’re simple, easy to use and present everywhere. These days, pious shaving purists go out of their way to scorn the cartridge razor. However, they’re not the world’s most popular method of shaving for no reason. Among their benefits are safety, availability, variety and ease of use. There’s a reason many fledgling shavers receive a cartridge razor for their eighteenth birthday. It’s arguably harder to cut yourself with a cartridge razor than with any other shaving device on the market. This makes it one of the safest, nick-free options for shaving. Especially if your hands are shaky or you’re new to shaving, a cartridge razor will likely be your safest bet. As one of the most popular men’s grooming tool, it’s also readily available in pretty much any store. This makes it an accessible, easy option. Cartridge razors can be purchased anywhere you find men’s shaving products, but can even sometimes be found in the essentials sections of gas stations, truck stops, dollar stores and any other standard, general store. Again, because the cartridge razor is so plentiful and popular, you also have more options when it comes to selecting one. If you’re particularly picky about your shaving products, this can be a bit of a plus. With so many brands and variations available, you can choose exactly the model that suits you. You can learn to use a cartridge razor immediately. Unlike alternatives such as straight razors, electric razors and safety razors, there’s no talent required. Without much practice, even a newbie shaver can achieve a clean, decent shave. Meanwhile, other shaving alternatives can take months (and many small injuries) to perfect – this takes patience and time that many men simply don’t have. If you’re a shaving purist who’s against cartridge razors, the good news is that you do have several other options. Three of the most popular alternatives include electric trimmers, double edge safety razors and straight edge razors. Electric trimmers get a bad reputation. Sure, they can’t get a shave quite as close as a traditional razor, but they’re designed for convenience and efficiency. The strength of electric trimmers is that they’re incredibly portable. They’re perfect for travel (especially if boarding a plane with a traditional razor is in question) and can be used pretty much anywhere. Their major downfall is that you’re forced to work with their limited battery life. Traditional razors require no charge and can be used as much as you want at a moment’s notice. They are, however, ideal for those wishing to skip the clean-shaved look and keep more facial hair. If this is your case, a professional beard trimmer is a better choice for men with all types of beards as it can leave behind scruff. For styling ideas, check out the list of best beard styles. All things considered, a solid electric trimmer might be a great, auxiliary addition to your shaving collection, but it can never get the close, clean shave of a more traditional razor. There’s a reason your grandad probably loved his double edge safety razor – they’re straightforward, effective and extremely affordable. Although they have a larger initial investment cost than cartridge razors, they pay themselves off with consistent use. At around 10 cents a blade, there’s no beating them when it comes to price points. The major downfall of the double edge safety razor is that they’ll never be nearly as safe or convenient as a cartridge razor. It takes a bit of skill and focus on learning your way around one. In the beginning stages, you’ll likely nick up your face and get a bit of razor burn. They’re also not ideal for use on any other part of your body. Meanwhile, cartridge razors are completely versatile and can be used on everything quite literally from your head to your toes, making them ideal for those who are bald and bearded. If the double edge razor takes a few ninja skills to master, then the straight edge razor requires a full black belt. These ultra-minimalist shaving tools are the original model of razor. They consist of a single blade and require manual sharpening. While trying to get the hang of a traditional straight edge razor, you’ll inevitably slice up your face a bit. So why does anyone bother? With the proper skill and focus, the sharpest straight razor can last you the entire lifetime. Meanwhile, in the category of longevity, the cartridge razor falls massively short. If you’ve ever used one, you know they wear out quickly and need to be re-purchased often. This makes them both costly and annoying to some men. If you want the classic shave of a straight edge razor with less of its danger and difficulty, you can always try to use a shavette. This is probably what your barber used on you last time you were in the barber chair. They work through the insertion of a disposable blade that can be tossed and replaced. 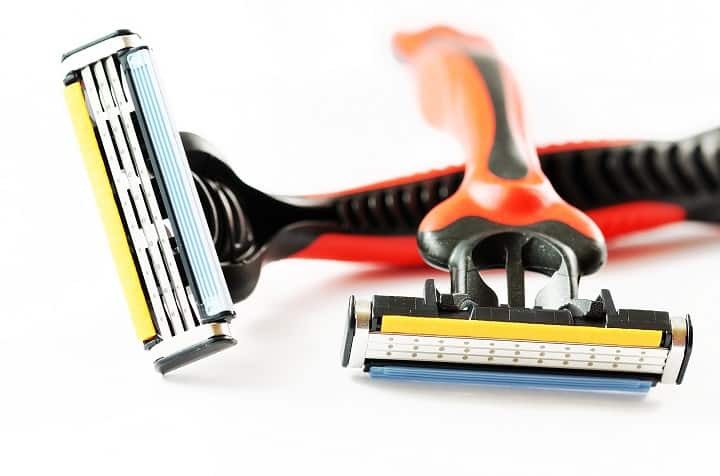 If you’ve ever even walked down the men’s grooming aisle in a supermarket and glanced at the shaving supplies, you’ve noticed that the number of blades is one of the biggest selling factors of some products. Some razors boast extra blades for closer shaves or added blades for additional precision. But does more metal really equal a better shave? 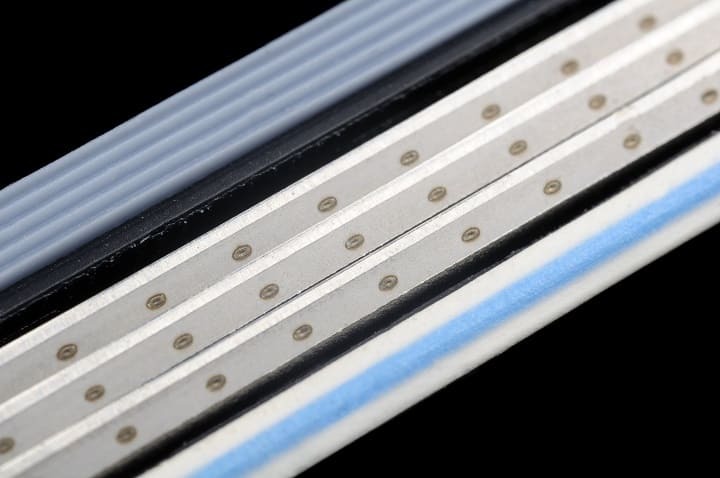 Blade numbers start at a single blade and can range all the way up to as much as 7 or 8. If you’re thinking that at some point it’s a little bit excessive, you’re probably right. Normally, after five blades, the implementation of additional blades doesn’t do much to improve the shave. Though some may argue, 7 and 8 blade cartridge razors are more for show and advertising purposes than actual shaving function. For some, more blades are better. They find it makes for fewer pass-overs and a closer cut. For most, the sweet spot is right around 4 or 5 blades. Any less and your blades will tire out easily and go dull. Any more, and you’re probably paying extra money for flashy, useless features. 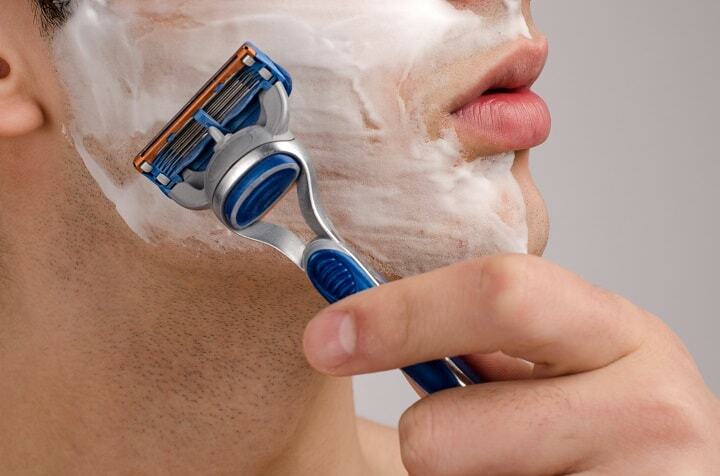 In some cases, men with especially delicate skin will find that cartridge razors with four blades or more irritate their skin, causing a rash. In these cases, two blade razors can be a great alternative. There’s not a ton of elements to consider when selecting a cartridge razor. If you’re having a particularly hard time picking a product, the good news is that many cartridge razors are disposable and therefore if you try one that doesn’t work out, you don’t have to stay committed. A number of blades, price and overall design, are the three defining factors when it comes to making a selection. How many blades you select depends entirely on personal preference, although it’s commonly accepted that between 3 and 5 is ideal. If you have particularly sensitive skin, a top razor for sensitive skin is often a cartridge razor with just 2 blades rather than 3, 4 or 5. When it comes to price, you’ll find that cartridge razors can be as affordable or expensive as you’d like. While affordable options do usually exist, these razors are usually single-blade and extremely poor in quality. One of the most important design factors in cartridge razors is the joint between the handle and the cartridge. Pricier products usually include a joint that swivels to allow for more flexibility. Cheaper versions will probably have no joint, making them unforgiving to shave with. There are three major shaving mixtures on today’s market: shaving cream, gel and soap. Each of these three products has the same, general goals – to lubricate the skin, allowing the blade to glide across it effortlessly, to moisturize and make shaving easier. However, each product goes about it a bit differently. Shaving cream’s major advantage is that it’s quick and easy to use. Often packaged in quick-foaming cans, shaving creams are probably the most common shaving mixture used today. If you’re shaving with a cartridge razor, it probably means you value efficiency. If that’s true, shaving cream might be for you. It’s a no tears, no drama, no stress product. Conversely, some shaving enthusiasts have sworn off cream products, claiming it clogs razors, causes skin dryness and creates a mess. Normally composed of the same ingredients as the average cream product, shaving gel differs mostly in its overall texture. A gel is slicker and smoother than its competing soap and cream products. This slickness makes it an excellent lubricant, allowing the razor blade to glide across the skin with ease. It also tends to have more hydrating properties than the average cream, although some men still claim it dries out their skin. The major complaint with gel, like cream, is that its thick texture clogs the razor and slows the shaving process. For true shaving purists, there’s no other option than a quality puck of shaving soap. These days, it’s used less and less, but it’s still considered the old-school, high-quality go-to option for that classic, barber shop shave. Unfortunately, shaving soap fell out of vogue for a reason. It takes a dash of skill, patience and effort to prepare and use it. With the invention of gels and creams, which are immediately ready and entirely user-friendly, shaving soap has become less and less popular. They’re not a necessity, but for the full shaving experience, a shaving brush is an absolute must. Especially if you’re using a high-quality shaving cream or soap, a brush makes the application process easier and more effective. It might seem like a silly, superfluous addition to your shaving supplies, but brushes actually serve a multitude of functions when used correctly. They help your razor blade perform better, lift your hairs for a closer cut, and allow shaving products to create a better cushion. Of course, you’ve got two good hands and you can always use them in place of a shaving brush. However, if you’re invested in quality, purchasing a decent shave brush is a relatively small expense. There’s no mystery about when pre-shave oil is intended to be applied. Usually, it’s a carrier-based skin product which aims to moisturize your skin before you bust out your razor. Additionally, its oil properties work as a lubricant against the blade’s edge, allowing it to glide effortlessly across your face without nicking or cutting you. Some products even claim to help prevent ingrown hairs. You might be wondering if pre-shave oil is worth it, especially when there are so many other men’s products aimed at hydrating the skin for shaving purposes. The truth is that in some cases, a quality, moisturizing face wash and solid shaving cream, gel or soap can definitely do the trick. For some men, however, just doing the trick isn’t quite enough and they want a true, premium shave. Pre-shave oil exists for these shave enthusiasts. Every shaving process should start with a warm shower or a splash of hot water to the face. This causes your hair follicles to swell and opens your pores, making for a closer, more comfortable shaving experience. Showering before your shave also gives you the opportunity to wash and moisturize your face before setting a razor to it, which reduces your chances or irritation, razor burns and ingrown hairs. You’ll want to first go with your showering routine as per normal, by soaping up your body and applying a top-rated anti-dandruff shampoo for men. Next, you’ll want to apply pre-shave oil. Ideally, you’ll want your shaving product to be warm, which can be achieved with the aid the best shaving cream warmer. Whether you’re shaving with a cartridge razor, safety razor or any other tool, remember to always shave with the grain. It might not be what your dad taught you so many years ago, but it’s an irrefutable truth. Shaving against the grain can cause severe irritation, rashes and ingrown hairs. The average beard grows in patterns and swirls, making your shaving direction hard to determine. There’s no shortcut – get to know your facial hair’s bends and curves and shave accordingly. So you’ve trimmed your fuzz and rinsed your preferred shaving products from your face, but hold your horses because the shaving process isn’t over yet. What happens during the aftershave is arguably one of the essential steps of a good shave. After you’ve rinsed off your product, it’s time to apply an aftershave or balm. These products help disinfect any potential nicks, soothe skin and lock in moisture. If you’ve left a few pesky marks in the shaving process, don’t worry. Some men will choose to employ the finest alum blocks to disinfect small cuts. Another option is a styptic pencil. No cartridge razor can live forever. Because they’re designed to be disposable, you’ll find yourself eventually needing to replace yours. Some products have a reusable handle that can be used with cartridge refills. 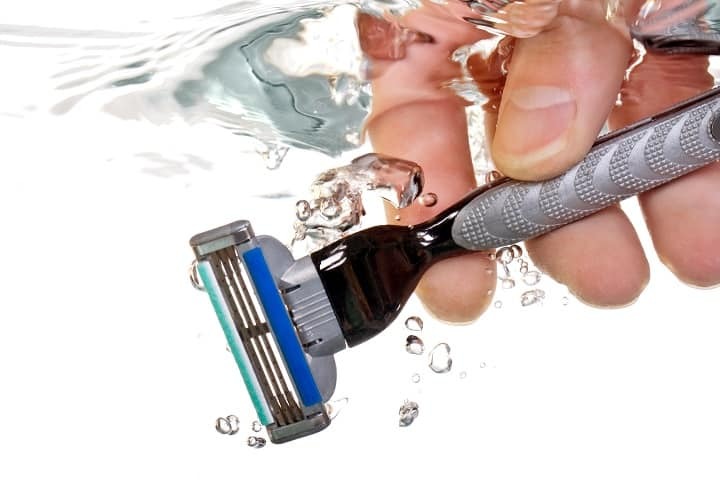 Alternatively, some razors are altogether disposable and will need to be replaced entirely. When that eventuality becomes a reality, try not to sweat it too much. When your cartridge stops being effective, you’ll just need to buy more cartridges or another razor and you’re good to go again. How many shaves you get out of each cartridge will depend largely on how thick your facial hair is, how often you shave and the quality of the product you’ve selected. As a good rule of thumb, you should be able to get between 6 and 10 shaves. How often should I change my cartridge razor? It’s recommended that you change your razor periodically, but how frequently will depend on how often you shave and which razor you’re using. The short answer is that there’s no hard, fast rule. You simply need to change your razor when it stops being effective. For some, this is after a week. For others, a single, quality cartridge razor can last upwards of a month. When the razor blades stop cutting effectively, begin dragging on the skin or start to rust, it’s time for them to go. Can I bring a cartridge razor on a plane? Safety razors and other shaving tools with removable blades are generally not permitted on a plane. If you happen to try and bring a set of the best safety razor blades through to your terminal, they’ll most definitely be taken from you. However, there tends to be more lenient with cartridge razors. One of the major differences between safety razor vs cartridge razor is that a cartridge razor doesn’t have removable blades, making it much less of a potential threat. Some airports will force you to take off your stylish chukka boots at security and others will let you pass through the detectors with your shoes on. At some airports, waxy substances like your favorite pomade for men are considered a liquid with a limit and at others, it will be considered a solid. In short, security practices vary from airport to airport. While most have no issues taking cartridge razors on a plane, it’s always ultimately left up to the discretion of the TSA agents at each specific airport. If you want to be safe, you should check online or give the airport a phone call to make sure your razor meets their travel requirements. How long do cartridge razors last? If you’ve purchased a cartridge razor with a reusable handle that can be utilized with replacement cartridges, it has a limitless lifespan. The only thing that will need to be replaced regularly is the cartridges themselves. These will need to be disposed of and replaced as soon as they start to dull. We’ll admit that cartridge razors aren’t the epitome of luxury, high-class shave. But there’s something to be said for their straightforward honesty and unrelenting reliability. These products are the world’s most widely used means of shaving for a good reason – they work. They might not have the bells and whistles of other shaving methods, but they get the job done. They’re drama-free, easy to handle and hard to screw up. Especially if you’re new to shaving or struggle to keep a steady hand, the cartridge razor has your back. Photos from: Cosmin35 / depositphotos.com, zamula / depositphotos.com, Voyagerix / depositphotos.com, Digifuture / depositphotos.com, hquality / depositphotos.com and iulianvalentin / depositphotos.com.